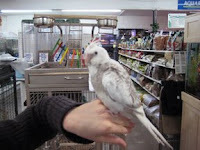 During the short period of time that I had my bird, we were very good friends. I got him for my eleventh birthday after saving enough money to buy the cage, food, and toys witch cost $200. The bird itself was $150. My parents paid for that. I named him : Alestor Socks Harry James Potter Albus Madeye. I got him after my ninth birthday present, a much loved, and very old girl rat named socks died a few months before. We called him Al because his real name was to long to use all the time. His cage was over four feet tall and very hard to clean for an eleven year old. A bird is very hard to potty train, and I'm sorry to say that his life was over before he got the hang of it. Most cockatiels live up to about fifteen years, but they can live up to twenty five. My cockatiel however was a whiteface and they are generally more susceptible to birth defects. Mine had a hart problem. I was able to command my bird to step up on my finger when I said step up. He would sit on my shoulder and lean his head down to rub it against my neck. Me and my bird had a wonderful time together. But, on February 13 2008 he died. The vet did a free autopsy, and we found out that he was born with an over large hart. It was a happy adventure with a sad ending. At the time I did not know that it would lead me to another great adventure: mammito.